Prime Minister Narendra Modi on Tuesday conducted an aerial survey of the flood affected areas in Gujarat. CMO Gujarat tweeted, "PM Shri @narendramodi took stock of the situation emerged due to heavy rains & floods in some parts of the state in a meeting at Ahmedabad"
Gujarat Chief Minister Vijay Rupani called on the Prime Minister at the Parliament House this morning and apprised him of the situation arising out of the heavy rains and flood in parts of the state. 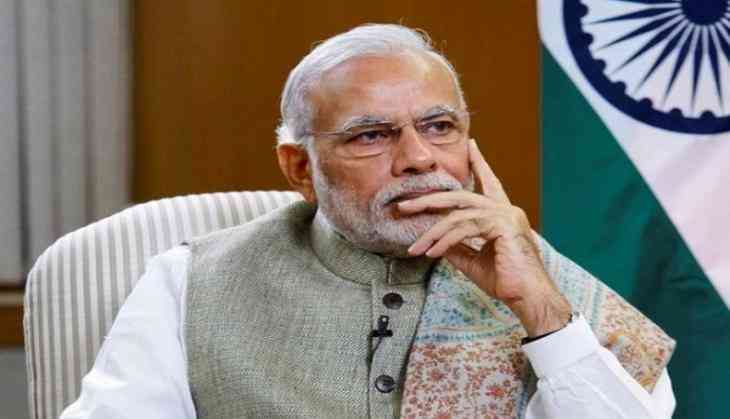 The Prime Minister then decided to undertake an aerial survey of the flood affected areas of north Gujarat, the PMO said. Heavy rains in Gujarat in the past few weeks have created havoc in the state due to flooding in several parts of the state. According to reports, seventy people have died in Gujarat due to rains till now. As many as 25,000 people were shifted, mostly in Banaskantha, as the district witnessed its worst floods in recent years on Monday. The affected people have been given food packets and provided shelter at a temporary relief camp. Due to excessive rainfall and heavy flooding, water entered many houses and residential areas in Gujarat's Patan. The two dams in Gujarat - Sipu and Dantiwada, both in Banaskantha - have been overflowing due to excess inflow of water and the heavy downpour adding more to it. The Army and Air Force reached the flood-hit Deesa of Banaskantha district for rescue operations. The Army, IAF, NDRF and local teams have intensified rescue and relief operations as several parts of the two districts were inundated with flood water. Nearly twenty-five thousand people have been evacuated from the flood hit regions, with rescue work still going on.